‘The Robots of Death’ made an instant impact upon its airing in 1977 and continues to rank upon Doctor Who’s very best serials thanks to a compelling character-driven plot revolving around the ever-present fear of a robot revolt. When the Doctor and Leela arrive on a seemingly deserted spaceship on an alien world, they soon find themselves in the presence of the Kaldoran Voc robots once more as something outside tries to gain entry and the truth of the past, present, and future of the civil war around them is called squarely into question. The robotic Vocs, Super-Vocs, and Dums of Kaldor remain one of the more intriguing collective presences in the Doctor Who universe, inherently neutral beings that can easily take on either heroic or evil roles given their propensity for external control and the sophistication of their internal circuity and the world treating them as subservient and second-class beings at best. It’s somewhat surprising, then, that they have only featured in the Big Finish Seventh Doctor tale ‘Robophobia,’ the Fifth Doctor BBC novel ‘Corpse Marker,’ and the occasional comic since their eponymous debut with the influential stylings of Taren Capel wreaking havoc. However, that leaves plenty of unexplored potential for these beings, and writer Andrew Smith perfectly taps back into this dangerous world of mistrust, setting up an intriguing mystery straight from the beginning. The Vocs on this ship have their memories wiped every couple of months to prevent essential information from passing into enemy hands should they become captured, and the small crew of robots with no humans apparent except for Commander Lind who is released from her medical treatment hibernation chamber at the Doctor’s behest create an uneasy suggestion that something is not quite right. Martha Cope plays Lind as a strong woman beholden to her beliefs while pursuing morality and justice, and though the character does serve as an expository device initially to explain that she is hunting the titular resistance group The Sons of Kaldor whose members are working with alien mercenaries to initiate a regime change, her mettle is effectively put to the test and proven by the story’s end as her reality is shaken at its very foudnation. In fact, the time of two weeks Lind believes she has been here has been two years, and the founding families referenced in the original have come into power once more with intentions of destroying all of the robots that have ever been assembled and- from their viewpoint- plagued society. Fronted by the megalomaniacal but engaging Rebben Tace, this group and its continuing goals are natural extensions of ideas established in the original television serial that go against Doctor Who norms and thus allow the plot to deftly avoid any common direct sequel trappings. Ultimately, and perhaps unsurprisingly, the robots themselves become the most engaging and prominent figures of the story as the mystery surrounding V26 and his own enhanced abilities slowly comes to light. For though V26 seems to be unique, he is but a front for a deeper movement that strikes right at the core of robotic culture as the knowledge of how to achieve sentience continues to spread within their ranks. This, by necessity, opens up the very moral debate of just what establishes humanity and whether a robot can ever truly be said to have achieved that state, but the wonder and pride with which the robots regard this enlightenment is superb, and the fact that they are intrinsically good in this nacent state without ever stooping to murder even when given motive and the chance opens up further questions about nature versus nature and whether evil is ingrained or learned given the violent insurgent humans around them. This isn’t necessarily ground-breaking or overly complex, but taking time to discuss this evolution of consciousness and conscience within robotic beings is a strong plotline that proves just how much these Kaldoran robots still have to offer future storylines if given the chance. 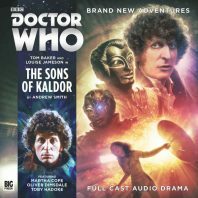 ‘The Sons of Kaldor’ expertly recaptures the sounds and tone of its intended era and is able to evoke very vivid imagery, and Tom Baker and Louise Jameson continue to have a spectacular chemistry that authentically and easily carries all of their scenes together. Though Leela does get the standout scenes alone as she discusses and tries to understand the burgeoning glimmers of humanity present, the Doctor certainly makes his presence felt as well as the two warring sides resume hostilities within the confined space. Time unfortunately does not permit any true exploration of The Sons’ beliefs and motivations or of Lind’s own beyond superficial statements which could have given an extra emotional and empathetic depth to the human conflict of this story to match the robots’, but the political and philosophical drama presented is nonetheless a solid beginning to the seventh run of The Fourth Doctor Adventures that springs to life as a fitting homage to a beloved story and era.